The most vibrant juniper berries I've ever seen. 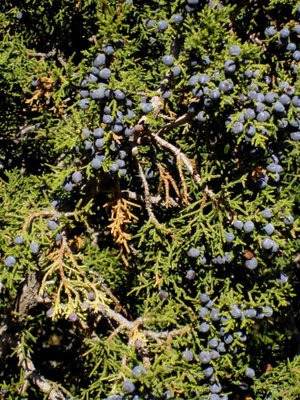 From Wikipedia: "A juniper berry is the female seed cone produced by various species of junipers. It is not a true berry but a cone with unusually fleshy and merged scales, which give it a berry-like appearance. The cones from a handful of species are used as a spice, particularly in European cuisine, and also give gin its distinguishing flavour."